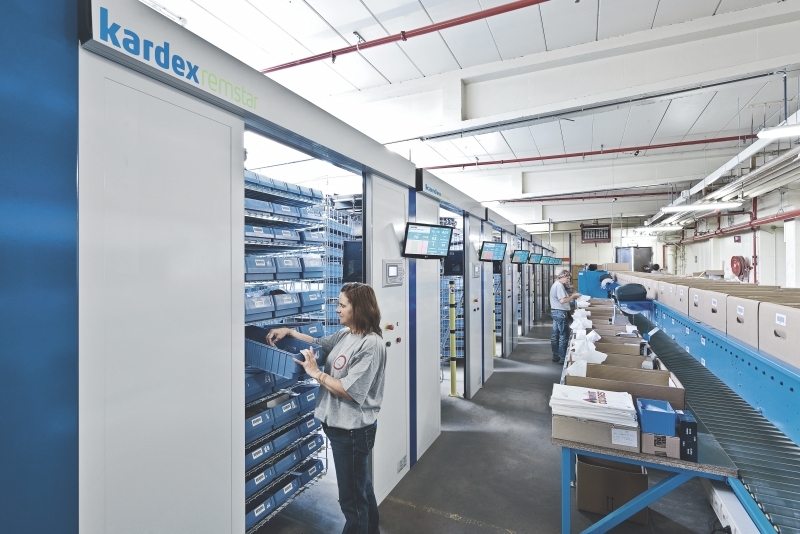 Our customers can be surprised that Horizontal Carousels can deliver one of the most rapid presentation of goods to man for small parts picking from any automated solution, usually easily surpassing the speeds of vertical picking solutions such as automated storage tower shuttles and vertical carousels. NSI are delighted to partner with Kardex Remstar in supplying these type of step-change picking solutions. A horizontal carousel makes optimal use of the existing room length. The central access opening positioned at the front of the carousel and the arrangement of the machines in so-called picking stations give the picker fast access to the stored goods on a minimal footprint. This reduces the travel time usually necessary for personnel working on a conventional shelf storage system. However, height can also be utilised by stacking one or more on top of each other supported by mezzanine platforms or other steel support structures, all of which NSI can design to building control approval standards, and offer a full supply and install service. We have also designed combined horizontal carousel and mezzanine floor systems to give full manual pick access in the event of a systems or total power failure. Whist inevitably this reduces a little of the footprint efficiency of your horizontal carousel, much of the stock density and all the speed of goods to man/picks per hour is maintained in the automated mode. Another advantage of this technology is that all horizontal carousels belonging to one picking station work simultaneously. This guarantees permanent access to goods and reduces unproductive staff waiting times to a minimum. The efficiency of the order picking depends of course on linking the carousel with intelligent warehouse management software (e.g. Kardex Remstar Power Pick Global) and using various optical display elements such as pick to light, laser pointers etc. There are many options to ensure your horizontal carousel is specifically designed to your business and operation. Picking performance can be improved even further if picking strategies such as “batch picking” are applied. Such investments as these can represent a step change in your operation, with rapid payback on manpower savings, use of footprint, and bring multiple safety and accuracy improvements. As such the projects tend to be of quite long gestation and solutions are unique to each customer. The specification and design needs to not just look to the future, but also be cognisant of the need to build and operate to ensure the business continues to function through the process transition. You need a patient partner who will work with you closely on such a plan over a period of many months, and will help build the business case to support the ROI for the horizontal carousel investment business case. NSI are that partner. To further speed up picking times, two or more horizontal carousels are often used in an integrated workstation with software and pick to light technology to perform batch picking. This batch picking configuration allows an operator to pick from one active carousel while the others are pre-positioning the next pick for the moment the operator is ready. The operator picks the total SKU quantity for all orders in the batch, and distributes the SKU quantity among all of the orders; only visiting that SKU location one time during picking. Batch picking multiple orders on a horizontal carousel at one time can increase productivity up to 66%. Optimised Picking: Picks are organised for efficient picking to speed pick times and increase throughput. Improved Accuracy: Pick to light technology improves accuracy to 99.9%. Save Space: Save up to 60% floor space. Flexibility: Easily adjust workstation configurations to meet peak season picking requirements. Extend Order Cut Off Time: Extend order cut-off times due to increased throughput.